APC chairman says no other party that is truly settled outside APC, and even the PDP is not stable because it is still fighting to get a chairman. 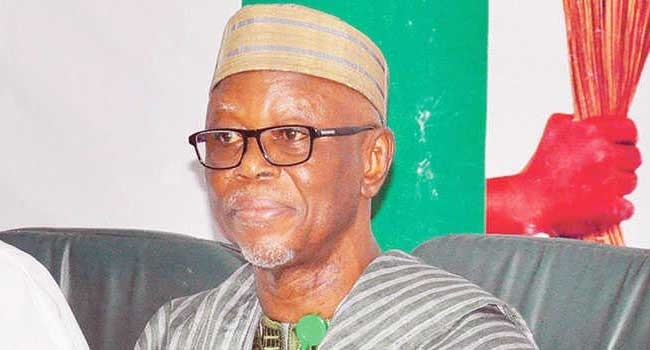 The National Chairman of the All Progressives Congress (APC), Mr John Oyegun, has assured members of the party that the exit of a former Vice, President Atiku Abubakar, from it will not affect it in anyway. He gave the assurance on Tuesday in Abuja when the Association of Former Chairmen, Councilors and Ward Leaders paid him a visit. The APC national chairman further assured the party members that Atiku’s exit from the party would not lead to massive defection from APC as being insinuated in some quarters. "Let nobody fear that the defection of the former Vice President is going to lead to any deluge. "Don't ever be afraid that there is going to be any massive defection. "As a matter of fact, the contrary is the case, APC is growing in strength on a daily basis,” he said. Mr Oyegun called on members of the association not to be deceived by; “the screaming and opposition rhetoric”, adding that everybody that mattered in the country, politically, was a member of the APC. He maintained that there was no other party that was truly settled outside APC, adding that even the Peoples’ Democratic Party (PDP) was not stable because it was still fighting to get a chairman. He further said that though the country might have its challenges, it was making steady progress.